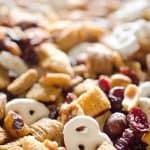 Sweet & Salty Cranberry Snack Mix is a party favorite filled with buttery cinnamon Chex Mix, yogurt covered pretzels, dried cranberries and mixed nuts. 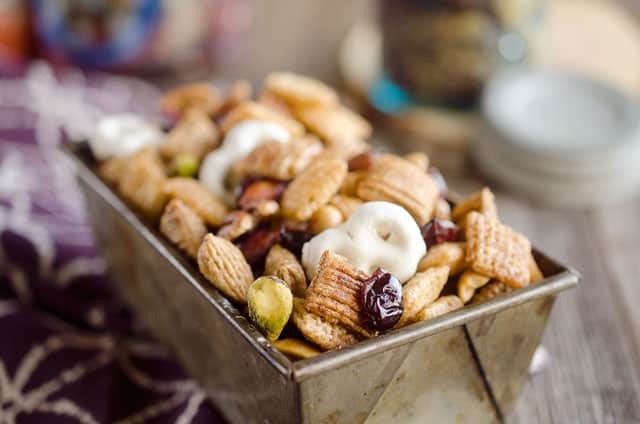 Snack mix is the perfect addition to any holiday. 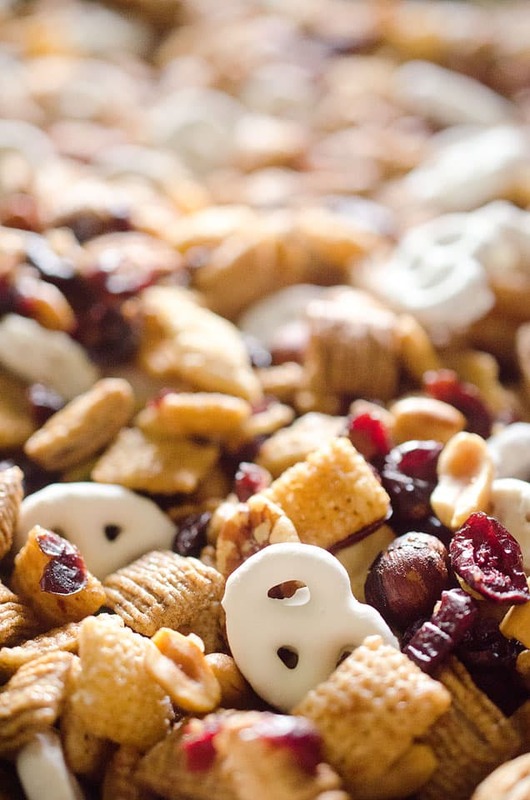 We grew up with traditional Chex Mix that my mom made, but I love adding my own twist each time I make it. This Cheddar Sriracha Snack Mix was one of my first attempts at a twist and it is perfect for the spicy snack lover. 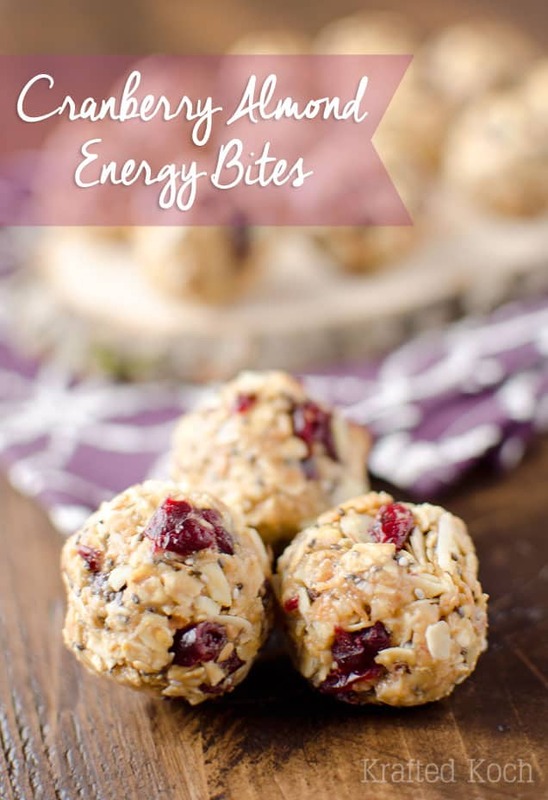 This cranberry version is for those of you who prefer something sweet. 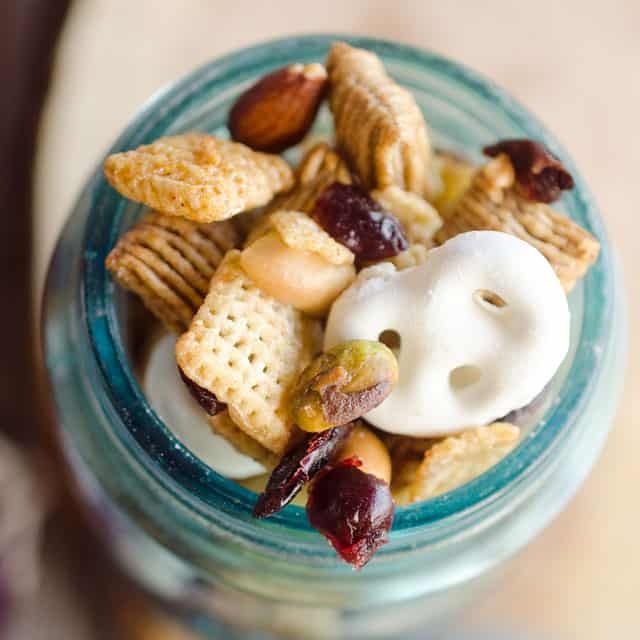 The mix of yogurt covered pretzels, nuts and cranberries with the Chex is a fantastic balance of sweet and salty that you are sure to love. Speaking of sweets, I have been to the dentist a few too many times lately. I was born with horrible teeth. I don’t know what it is, but no matter what I do, give up soda, cut out sugar, you name it, it doesn’t change the fact that I have a cavity at just about every 6 month visit. I don’t have any fears of the dentist, as we basically grew up there with my mom working at our local dentist’s office for almost 20 years. Because of this, we obviously were instilled with great oral hygiene practices from a very young age. If we even thought about going to bed before brushing our teeth we would hear my mom yelling from her bedroom that we needed to brush our teeth. I swear, that woman not only had eyes in the back of her head but also some sort of telepathic abilities?! Anyways, that is all to say, we brushed our teeth…a lot! Nevertheless, me and my brother would always get cavities while my other two siblings literally NEVER get cavities! How is that fair?! Yes, I know, life isn’t fair. Needless to say I was back at the dentist the other day after just visiting to get a crown and a filling. My bite was a bit off after getting the work done and my teeth started hurting progressively more throughout the week. Life is just not fun when it hurts to chew, much less dealing with the throbbing pain throughout the day. Preheat your oven to 300°. 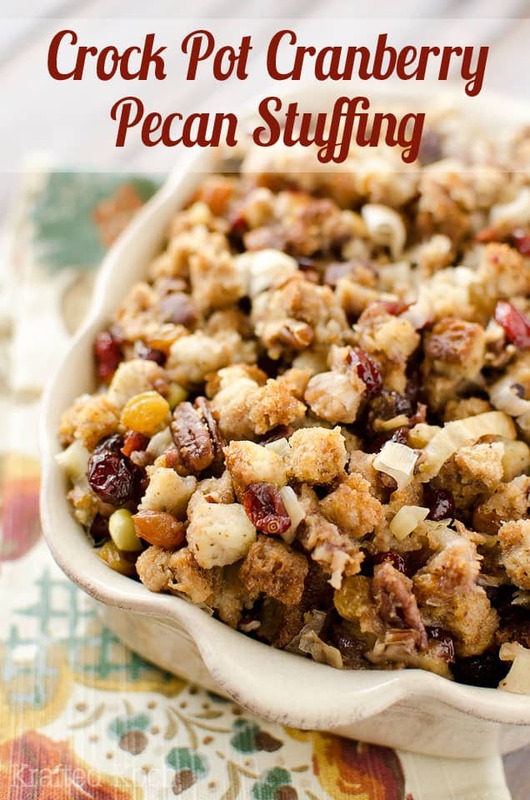 In a large roasting pan, add the Chex, Oatmeal Squares, cranberries and nuts. In a small bowl, combine the melted butter, honey, cinnamon and salt. Give it a quick stir and pour it over the cereal mixture in the roasted pan. Using a large spatula, fold the mixture together until all of the cereal is well coated with butter. Bake for 30 minutes, stirring every 10 minutes. 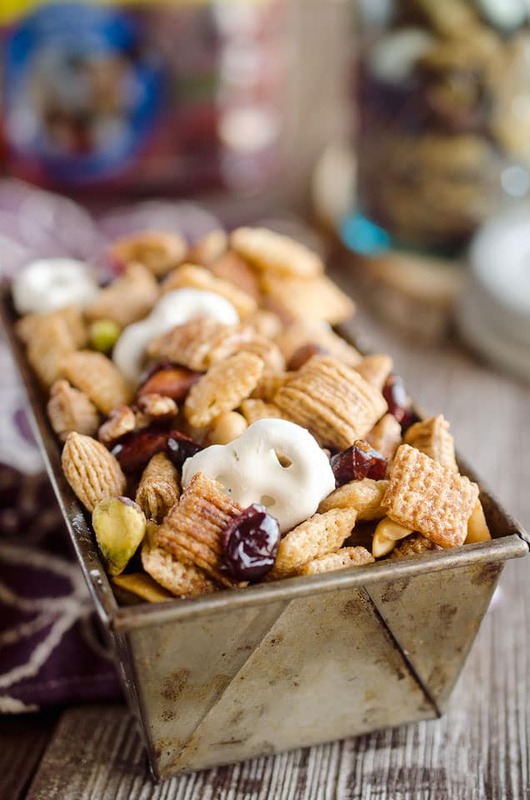 Spread the snack mix over wax paper and allow to cool. 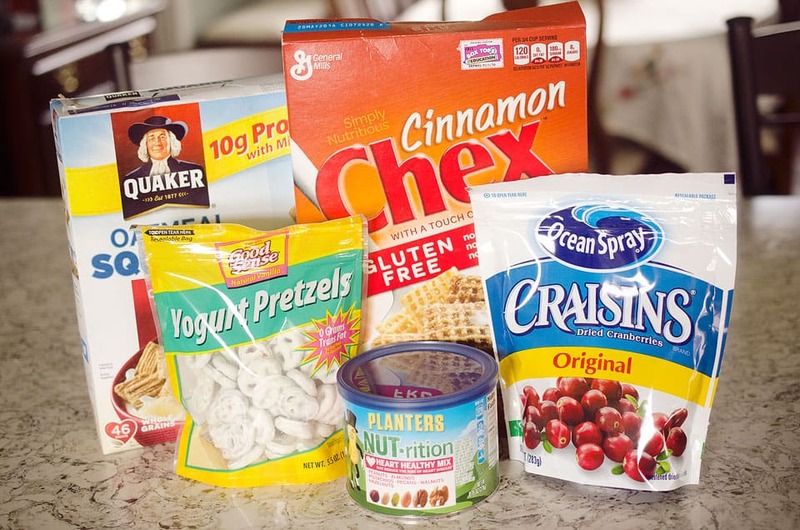 Mix in the yogurt pretzels and store in an airtight container. Mmmm I’m all about the sweet snack mixes as you might imagine! 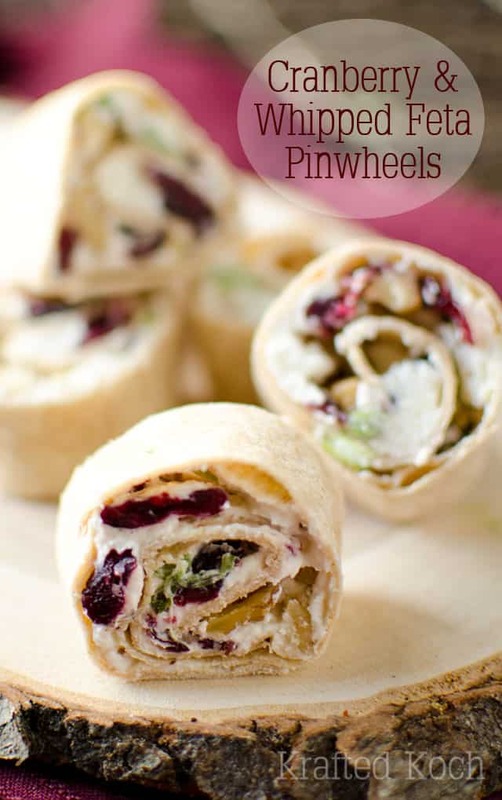 Love this cranberry twist. I’m glad you got that tooth fixed. You were in some major pain! So very good! Easy to make. The only change I made was to reduce the salt from 2 teaspoons to 1 scant teaspoon – that was plenty and we could taste the balance of the salt.